China-Africa Construction Machinery Cooperation and Development Forum was held in New Beijing International Exhibition Center successfully on 22nd Sep, 2017. As one of the important international forums during BICES 2017, it is aimed to establish a bridge for China-Africa Cooperation relying on BICES 2017, a great occasion of the world’s construction machinery industries. The Forum was presided over by Mr. Zhou Weidong, Deputy Chairman of China Council for the Promotion of International Trade Machinery Sub-council. Representatives and ambassadors of embassies of Republic of Angola, the Democratic Republic of Ethiopia, the Islamic Republic of Gambia, the Republic of Ghana, the Republic of Guinea, the Republic of Kenya, Libya, the Republic of Mozambique, the Republic of Namibia, the Republic of Senegal, the Republic of South Africa, the Republic of the Sudan, and the Republic of Zambia presented at the meeting. Mr. Qi Jun, President of CCMA, and Mr. Zhang Yi, Director General of China-Africa Friendly Economic and Trade Development Foundation addressed the forum. 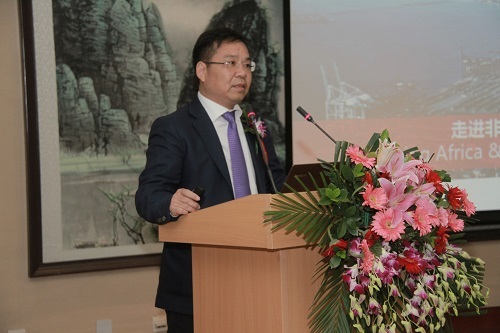 Mr. Zhou Wanchun, Vice President of Sany Heavy Industry and Director of International Headquarters, and Mr.Wang Xiaohui, President Assistant of SDLG and General Manager of Import & Export Company made speeches on the Forum. Meanwhile, hundreds of representatives from well-known Chinese construction machinery enterprises like SANY, LINGONG, XCMG, SINOMACH, LIUGONG,SHANTUI, XUANGONG, DADI MACHINERY, TONGLI, DEGONG, LISHIDE, TIAN SHUI FENG DONG, SICOMA, SUI ZHOU specialized vehicle pavilion attending BICES 2017 were also present. Firstly, CCMA President Qi Jun addressed the Forum, extended the warm welcome to the envoys from 15 countries, and introduced the development of the friendship between China and Africa, cooperation on construction machinery businesses between China and Africa countries, as well as the new technologies, products and achievements presented at BICES 2017 on the theme of “Inheriting the China-Africa Friendship, and Making Joint Efforts for Bright Future”. He hoped that China and Africa could establish closer cooperation in the field of construction machinery, and could extend and comprehensively improve the all-round cooperation via the Forum. Zhang Yi, Director General of China-Africa Friendly Economic and Trade Development Foundation, noted in his address that, the Forum will help the envoys from embassies of African countries in China to establish communication platform with Chinese construction machinery enterprises, enhance the mutual communication, match them with suitable Chinese partners, and assist Chinese enterprises in better understanding the trading and investment related policies inAfrican countries, as well as the demands of the construction machinery sector. H.E. Elya Kiamo, Ambassador of the Republic of Namibia to China, spoke highly of the friendship between China and African countries, and extended his gratitude to Chinese Government for the assistance given to the African countries including the Republic of Namibia in developing the construction machinery sector and other sectors in African countries. Then, H.E. Thandukwazi Nyawose, Economic Counselor of the Embassy of the Republic of South Africa to China/ H.E. A. L. K. Mwape, Ambassador of the Embassy of the Republic of Zambia to China, and H.E. Mwayi Kennywa, Minister-Counselor of the Embassy of Kenya to China introduced the development conditions and demands for construction machinery in their countries respectively, and hoped to establish closer cooperation with China in the field of construction machinery. Zhou Wanchun, Vice President of Sany Heavy Industry and Director of International Headquarters, delivered a keynote speech themed “Entering Africa for Win-win Cooperation”, and introduced the basic information and main products of SANY, as well as the coverage of SANY’s products in Africa and the prospects for cooperation between SANY and African countries.